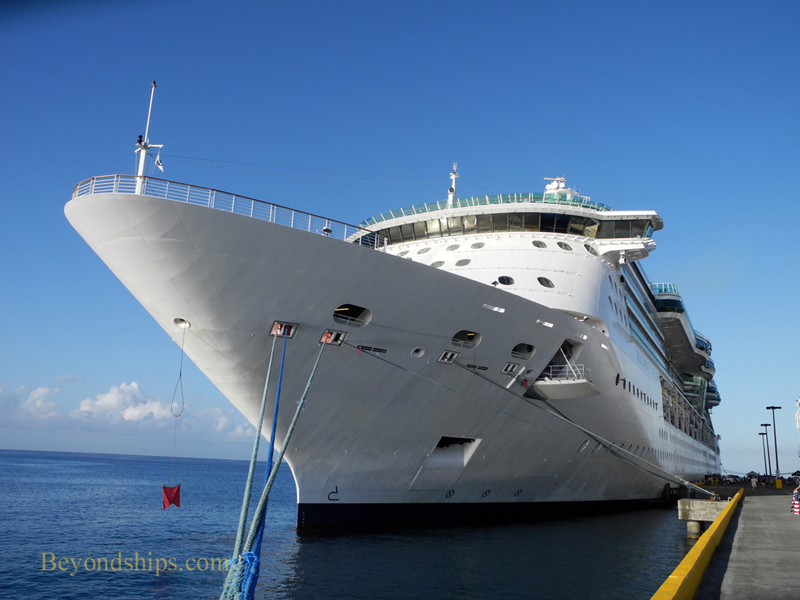 Brilliance of the Seas is often referred to as Royal Caribbean International's explorer ship. She has spent much of her career deployed in exotic places developing new cruise markets for RCI. However, for the winter season 2012 - 2013, she returned to the Caribbean, the place where modern cruising was born. Based in San Juan, Puerto Rico, she patrolled waters and the islands that remain the center of the cruising industry. In this essay, we see Brilliance in two Caribbean ports: St. John's, Antigua and Frederiksted, St. Croix. We first see Brilliance docked at Heritage Quay in St. John's. There are some clouds around but overall it is a sunny day. Her passengers are off exploring the island and Brilliance is left in the company of the other cruise ships calling today and the passing tour boats that are taking visitors off for a day of adventure and/or relaxation. The sun has begun to set and having recovered her passengers, Brilliance backs out of her berth, does a 180 degree turn and heads out to sea. The next morning finds Brilliance at the Anne E. Abramson Marine Facility in St. Croix. The clouds of the previous evening disappear quickly in the morning sun. As in Antigua, Brilliance is soon joined by Royal Caribbean's Vision of the Seas (below). The two ships are brilliantly lit by the early morning sun. Brilliance has sleek lines. RCI Fleet Captain Herman Zini has described Brilliance and her Radiance class sisters as "the Maseratis of the fleet". Similarly, Captain Kevin Oprey, now of Cunard Line, has praised their race car-like characteristics. The sun climbs higher, the passengers go ashore and Brilliance waits for their return. Above: Some passing late afternoon storm clouds provide a different backdrop for Brilliance as she prepares to sail.